The Philadelphia Conference was to the LGBT civil rights movement what the Seneca Falls Convention was to the women’s rights movement. 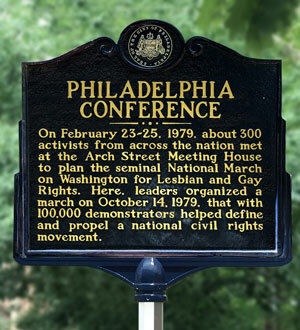 In February 1979, in response to the assassination of San Francisco Supervisor Harvey Milk, 300 activists from around the nation met at Philadelphia’s Arch Street Meetinghouse to fulfill Milk's dream of a march on the National Mall. Eight months later, on October 14, about 100,000 protesters participated in the National March on Washington for Lesbian and Gay Rights. The march established gay and lesbian rights as a national civil rights movement.